As most of you know, I grew up in Norfolk. Although my Grandfather was a farmer, he had sold the farm and retired to city life by the time I could walk. As a result, the closest I came to farming during my childhood was watching my father care for his 2-3 tomato plants each year. And you may recall from previous shares, I have had gardens (very generous description) on my deck. So, you can imagine the shock to my system when I officially became a farmer last week. 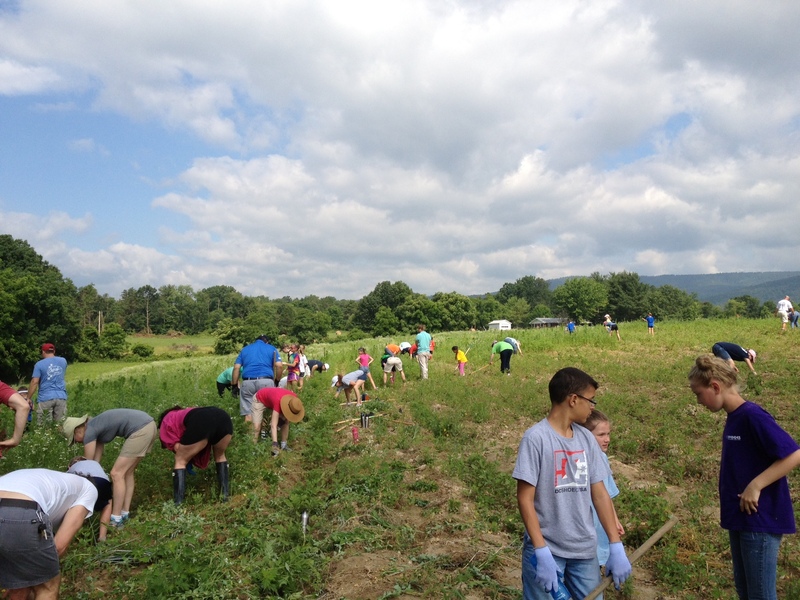 For several days I joined a group from Charlottesville as we journeyed to The Volunteer Farm of Shenandoah Valley. This 40 acre farm is very different from Polyface Farms that I wrote about last month. This farm produces 165,000 pounds of beans, cabbage, squash, tomatoes, potatoes, watermelon, cantaloupe etc…Everything that is harvested goes to the Blue Ridge Food banks throughout VA. Since it is a non profit organization and has only 1 full time farm manager, they depend on volunteers to tend the crops. The organization itself was fascinating to me and I was intrigued by the logistics and details needed to harvest and produce all they do. But what was most memorable, was the work itself. We literally went to a potato field that appeared to be the size of a couple of football fields. In the heat of the sun, we were given our mission. We were to weed the field. First thing that ran through my mind was -“are you kidding me…I thought we are going to be farming”. The farm manager patiently explained to us city slickers – the weeds will over take the potatoes and more importantly drain the potatoes of the water and nutrients they need. Made perfect sense but still a little overwhelming to see football fields of weeds…. Our group of 20, along with 30 people in another group spread out across the rows. The work was hard and it was hot. But soon, I began to see our groups gain rhythm and make progress. Just like many other things, as we worked together and found our groove, we “cleared more and faster”. At some point, the conversation shifted to acknowledging the hard work that goes into getting each potato to our plate. And when someone accidentally pulled a potato up (the tops are green like weeds), we found ourselves gently planting it back into the earth and talking nicely to it so it would not be wasted! By the end of day one, we could see progress. We did not completely clear the field but you could definitely tell we’d been there! We were proud, tired and ready to rest. As for the next day…I admit, we had to get ourselves psyched up to return to the football field of weeds…and there was 60% chance of rain. Oh boy, weeding potatoes in the rain!!! You can imagine our delight when we arrived and got our instructions….they wanted us to plant!!! 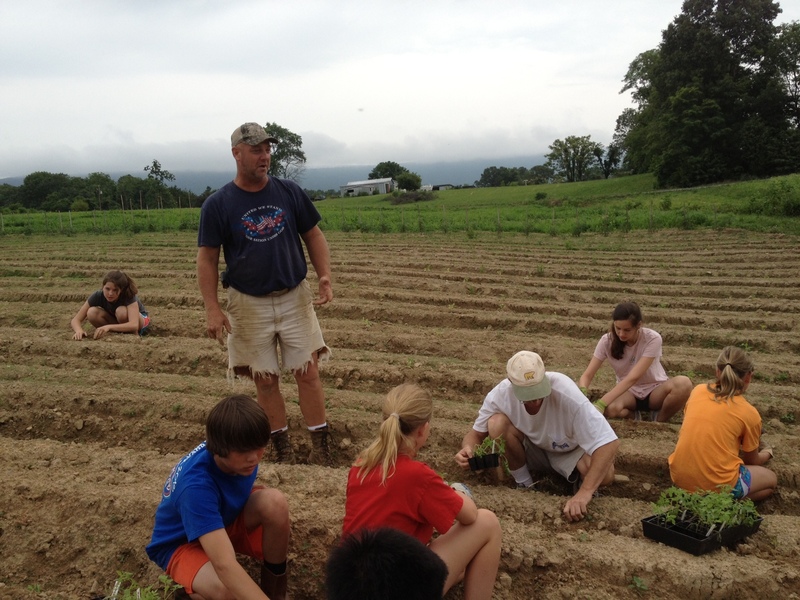 It rained but it did not matter in the least….we planted and planted and planted – rows and rows of tomatoes and peppers! At the end of our time there, we all looked back and with pride said…well done. It was certainly worth the time to assist this organization. As an additional benefit, we all became more mindful and appreciative of where our food comes from and what it takes to get it to us. And I am thankful…God made a farmer.